Each cart can charge laptops, Chromebooks and iPads simultaneously in the same cabinet. The double-lock doors ensure that devices are well-protected, and tablets are secured, for round-the-clock protection while charging. They can be programmed for sequential charging so as not to exceed the 15 amp limit in many classrooms. 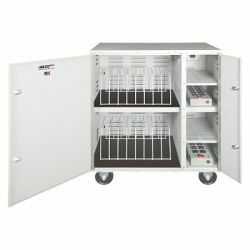 20-bay cart charges up to 10 devices at once. All other features the same as HECLTBB10. 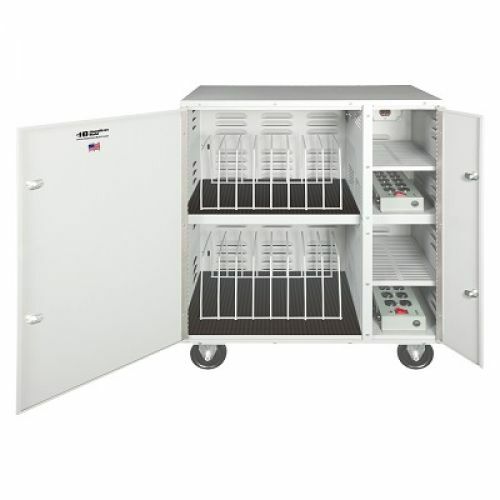 25 3⁄4"L x 17 1⁄4"D x 27 3⁄4"H. PowerStacker™ 20-Bay Charging Cart with HECLTDDCS Set of 4 Casters Weight 102 lbs. Additional shipping charges apply.